Raj Patel wrote the book Stuffed and Starved: The Hidden Battle for the World Food System. I have only read excerpts of the book but have recently subscribed to his blog and am eager to read the whole book. One of his most recent posts is about a study comparing the energy it takes to run a conventional farm vs. an organic one. Questions of how best to feed the world are immensely complicated and Raj doesn’t shrink from these complications. Having coincidentally tuned into a debate on npr on my way to the airport the other night (to pick up another worthy-of-following food figure Bryant Terry) about whether organic food is just marketing hype, I was particularly interested to look at the study Raj discusses and its massive amounts of data. Subscribing to Raj’s blog has been a welcome addition to my more strictly food/cooking blogs (with the exceptions of Michael Ruhlman who regularly interjects food system/policy related rants (his word!) into his posts and Culinate). When you spend as much time as I do cooking, testing recipes, planting and tending a vegetable garden, shopping at local farmers’ markets, and just living in one of the “bread baskets” of the world, it is sometimes easy to lose sight of the challenges we face locally, nationally and globally when it comes to food, food-security, access to real food, . . .
All this to say that I am trying to find a balance between being totally immersed in the details of cooking and teaching with an awareness, no more than an awareness, maybe tactics to infuse a bit of the challenges of our food-system into my work. Whether that means teaching free classes to Portland Farmers Market shoppers who use their Oregon Trail cards (starting in May) and really making simple, local ingredients shine in all my classes, I am going to continue thinking about ways to advance a healthier more equitable food system. Now to the recipe! And speaking of local and organic, eggs are one of those things (like tomatoes) where once you’ve had a good egg–fresh, local, bright yellow/orange–it’s hard to go back to grocery store eggs. And speaking of food system challenges. 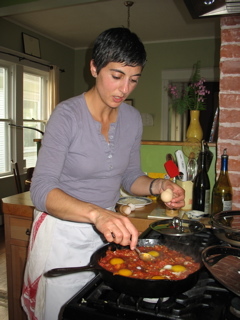 .. figuring out how to make good eggs like this accessible to much of the world should be at the top of someone’s agenda. Eggs are such a little miracle of deliciousness, protein, nutrients of all kinds, and adaptability. I taught this recipe in class this weekend to rave reviews. This dish is sometimes called Eggs in Purgatory but whatever you call it, just make it! In a 3-quart saucepan, heat the olive oil over medium heat. Add the onion and garlic, and cook until soft and light golden brown, about 8 to 10 minutes. Add a few pinches of salt and the thyme and carrot, and cook 5 minutes more, until the carrot is soft. Add the tomatoes and juice and bring to a boil, stirring often. Lower the heat and simmer for about 30 minutes until as thick as hot cereal. Season with salt and pepper. This sauce holds 1 week in the refrigerator or up to 6 months in the freezer. Heat tomato sauce in a wide sauté or frying pan until bubbling, turn down to medium/medium high. 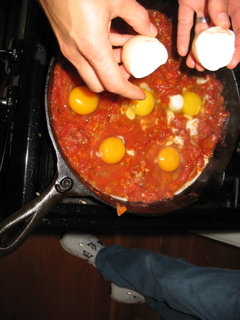 Make slight indentations in the sauce with a spoon and crack eggs into indentations. Sprinkle generously with salt and a few grinds of pepper, sprinkle on the parmesan (if using) and cover the pan. Cook until the eggs are cooked to your liking—about 5 minutes for typical poached egg quality. Serve with toasted bread and Salsa Verde on the eggs. There are many variations of this simple sauce. Vary it as you like but start with a couple of handfuls of parsley, chopped. Add salt, pepper, lemon juice, minced garlic and olive oil to desired consistency and taste. It doesn’t take much garlic so start with half a small clove. It should be strongly seasoned since it is used with mild dishes but the garlic can easily overpower things. You can add chopped capers or anchovies as well but for the poached eggs I think the simpler one is best. This sauce is also wonderful over roasted root vegetables, over a hash of veggies and /or potatoes, with fish or beef. Poached eggs are my favorite, whether cooked plain in lightly vinegared water or in a Spanish piperade (recipe at http://bit.ly/hWrwR ). Thanks for this version! Thanks for the recipe. Can’t wait for summer and peppers! Any funny taste from acidic food in a cast iron pan? No there wasn’t. I’ve rarely experienced that and don’t leave the sauce in the pan for long once it’s cooked which may be why it wasn’t a problem.